The Axor Starck X collection embodies minimal design and maximum enjoyment. The special presentation of flowing water is typical of this. The water flows in a wide, smooth gush spray from a square plate which appears to hover weightlessly above the wash basin. The almost sculptural collection plays with symmetry and clear geometry. Axor Starck X can be installed as a single-hole lavatory faucet in three different heights. 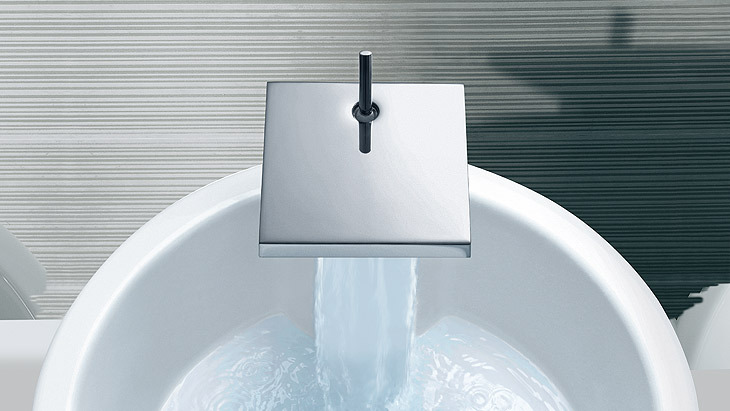 The collection also offers electronic faucets and a version for the wall. Different surface-mounted faucets, thermostats and valves are available for the shower and bathtub, plus a free-standing bathtub faucet. The Axor Starck X collection is completed nicely by a bidet faucet.